At age 78, Woody Allen is still making movies. 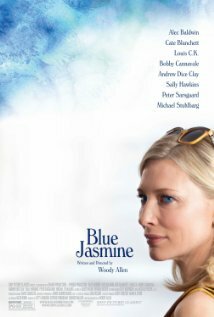 His latest is Blue Jasmine, with Cate Blanchette as a Blanche Dubois-type character with an unhappy past and an uncertain future. She is Jasmine (née Jeanette) Francis, a former Park Avenue society lady who has taken a long fall. She tries to bolster herself up with bluster, pills, and booze, but she’s not fooling anybody, least of all herself. Jasmine’s husband, Hal (played by Alec Baldwin), is a high-flying business entrepreneur. For the years that he is wildly successful, he and Jasmine live a fairy tale life. When Hal’s business dealings begin to unravel, though, he is found to be a cheat, a fraud and a liar. He has swindled investors out of millions. To make matters worse, he has been cheating on Jasmine with a whole string of other women. When he tells her he is in love with an “au pair girl” who is practically a teenager, Jasmine calls the FBI and informs on his dirty business dealings. He goes to prison and she loses her standing in society, not to mention her jewels, cars, furs, houses, etc. Jasmine eventually meets a man at a party named Dwight. He is apparently the kind of “good” man that she had been hoping to meet to take her out of her dreary existence. He works in the State Department, seems to have plenty of money, and has just bought a beautiful house that he wants Jasmine to decorate for him (she lied that she is a decorator). Dwight plans on marrying Jasmine until a chance meeting with her former brother-in-law, Augie. Augie is still bitter about the money of his that Jasmine’s husband lost and spills the beans to Dwight about all the sordid details of Jasmine’s life that she had kept hidden (and all the lies she told). After Dwight learns the truth about Jasmine, he no longer wants to marry her. Blue Jasmine packs more of a punch than a lot of Woody Allen’s more recent movies. For my money, it is much more interesting than the highly acclaimed Midnight in Paris. Jasmine is such an interesting, complex character, as are Ginger, Augie, and Chili. I’m sure the similarities to Tennessee Williams’s A Streetcar Named Desire are not accidental (Jasmine as Blanche, Chili as Stanley, Ginger as Stella, Dwight as Mitch). What better starting point could there be?